The Octopodis is a creature concept that started off from one design and ended up with something completely different. I started to draw the design from a previous sketch of a tentacled creature with armor plating that served as limb harnesses, and I wasn't getting the design I wanted, but I got something different and I liked it. The armor was made to have a nautical theme and the eye dots were a last-minute addition to the give the chest plate an octopus facial feature. 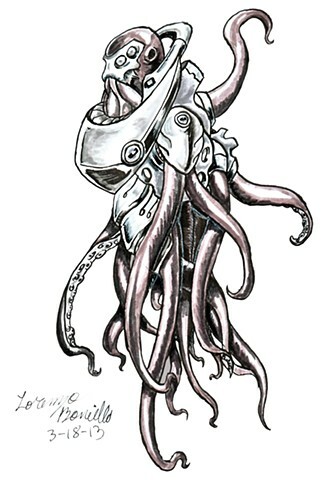 The Octopodis is a cephalopod creature that wears levitation armor that enables it to float and breathe freely. This is a combo based creature that relies on its numerous tentacles for strong grapple and thrashing attacks. This is a melee type summon that has two trick attacks and anyone familiar with octopi can figure it out; camouflage and ink spray.